After reading Smidgens Bits and Snippets post yesterday, Thursday Thanksgiving Question I had to share my story that relates to hers. When I married (the first time) I used to stuff my turkey with my mom's recipe. 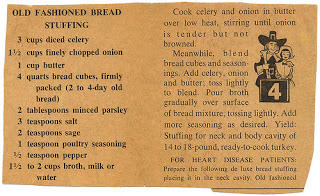 Old fashion bread stuffing. I loved it. One time, we went to a friends house for a non-holiday turkey dinner and my boys LOVED her stuffing. I never seen them eat so much. So I asked her and she admitted to using Stove Top. She added some "fluff" to make it her own. When Thanksgiving rolled around, they kept asking me, if I was going to use, "Susie's stuffing." I added onions and celery and used turkey broth. I found I couldn't make enough - I stuffed the bird, plus I had to make a casserole of it as well, for leftovers. It was a HIT. At times, I would try and experiment on a new recipe and they would throw a fit. WHAT have I done? They are grown men now, and they always ask me, "Stove Top stuffing?" Oh what difference does it make, anyway? They love it - it makes me happy that they are happy. So that is my secret recipe for stuffing. My sister, (God rest her soul) was like this gourmet cook - and she would always joke about people who used Stove Top. I just kept my mouth shut - and never invited her for holiday dinners where I served Turkey. Cranberries. I used to make homemade cranberry sauce. Easy peasy but they never liked it. 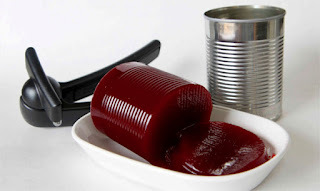 So one time, my youngest asked me if we could have the "real cranberry sauce" for the next holiday. I asked him, what he meant, thinking he wanted the homemade kind. "No Mom, the one that slides out of the can." Oh my, they're hopeless! and so am I. So I always make some homemade for my husband and I. And I always have the kind, they like - that slides from the can. My family loves that cranberry sauce too! We eat it year round. I love your Stove top story. I'll bet your sister would not have noticed that you used Stove Top!! A lot of somebodies must be making it and keeping it a big secret, because it hasn't been discontinued, yet. I buy the store brand now - I don't take a differencewhen it goes into the bird. So funny, homemade just isn't good enough. Have a good Thanksgiving. Thanks Ann. I love Thanksgiving. I am not as fond of them as I used to be - too sweet and I am more of a savory-person. I love the type of cranberry that slides out of the can! I'm the only one that does now so we rarely have it :) My mom made homemade stuffing and she was in the kitchen bright and early on Thanksgiving Day working on making it and getting the turkey ready to stuff to be put in the oven at a reasonable time. It was delicious and I'll never duplicate it; not sure if my sister who is the cook in the family even has the recipe or if my mom used a recipe. We use Stove Top. Quick and easy and somehow there is rarely leftovers, no matter how many boxes we make of it. Yep, good old Stove Top!